Our guest blogger, Christine Simon, has put together some facts on our own Giant pacific octopus. The post was originally submitted for a marine biology class at Duke University. – Giant Pacific Octopuses have three hearts! Two hearts pump blood to the gills, and the third services the rest of the body. – They have blue blood! Their blood uses hemocyanin instead of hemoglobin to carry oxygen to the tissues, thus the blood is blue when oxygenated. – GPOs are masters of camouflage! They have chromatophores in their skin which allow them to change colors in an instant- from dark red to grey to sand- to the exact color match of their rocky reef habitat. Giant Pacific Octopus Octopus dofleini are shell-less cephalopods in the order Octopoda, in the family Octopodidae. Their genus Enteroctopus (frequently called large octopuses ) includes only four species, of which the GPO is the largest. All of the Enteroctopus’ are found in temperate waters, with the GPO being the only one found in the Northern Hemisphere, in the Pacific. The other three species are found, according to species, in New Zealand, along the Pacific coast of South America and on the southern coast of Africa. GPOs have a short lifespan of only 3-5 yrs. They hatch from eggs about the size of a grain of rice, and drift in a planktonic stage for several months. Later, they live a solitary lifestyle in a den. GPOs mature between 2-3 yrs and mate only once in their lifetime. During the mating process, the male slips a spermatophore into the female’s mantle, which she stores until she is ready to lay eggs in her chosen den. As the eggs pass by the sperm, they are fertilized; she secretes the eggs (20,000-100,000) in strings along the wall of her den. She tends the eggs for 6-7 months, rarely leaving the den, staying to softly aerate them by blowing them with air from her siphon. The male dies shortly after mating. After the eggs hatch, the female blows the hatchlings out of the den into the world; she dies shortly afterwards. As predators foraging in their habitat, GPOs make extensive use of their adaptations to capture their preferred prey- crabs, shellfish and fish. GPOs have chromatophores in their skin that allow them to change color, as well as an ability to change their texture- which allows them to ambush their prey, nearly invisibly camouflaged into their surroundings. They have a venomous bite to kill their prey, once they’ve secured it. They can use their siphon to blow away sand, to reveal hidden shellfish or crabs. Strong suckers on their arms allow them to open bivalves or rip them from a nearby rock, which are then crushed by its chitinous beak. They have been known to use tools, and also to use reasoning abilities—GPOs will steal crabs already caught in a fisherman’s crab pot, by squeezing into the pot, eating the crabs, and then exiting the pot, leaving just the shells. The octopus has the largest brain of any invertebrate, with 60% of their neurons in their arms, allowing their skin to change colors instantly, and allowing them to use their suckers for taste, smell and feeling. There is ample data confirming the intelligence of this non-human animal- in captivity they have been known to play games, solve problems, open jars, even twist a Rubik’s cube. When kept in captivity, there is ample evidence of their ability to escape their tank. A study has even been done confirming that GPOs, with repeated contact, can recognize specific individuals. Octopus populations are resilient, as they have short lifespans and produce many eggs at once. According to the Washington Dept of Fish & Wildlife, the giant pacific octopus is not at risk in the Puget Sound, however they are beloved in the area. 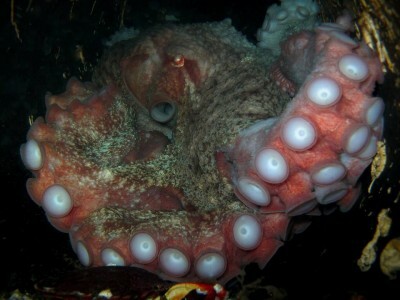 The Annual Octopus Census occurs in Feb, when recreational divers report sightings of GPOs, in an effort to determine local numbers in an informal manner, which are reported to scientists at the Seattle Aquarium. Hunting GPOs is allowed by permit in the state of Washington (maximum allowed is one per day). In Oct2012, a young man provoked outrage in the community when he legally harvested a GPO from a popular local dive site, which drove the formation of the Citizen Advisory Committee, including representatives of the sportfishing and diving community. They worked w WDFW to develop protections for the GPO in Puget Sound, and in Oct2013, a policy was passed, prohibiting recreational harvest at seven popular dive sites, which together encompass 1300 acres of habitat. Outside of Puget Sound, the GPO is routinely harvested for food or bait in both Alaska and Japan. The leading expert on Giant Pacific Octopuses, Dr Anderson was an avid scuba diver w a special interest in cold water cephalopods of Puget Sound, however his research interests focused on the GPO. Dr Anderson did his PhD in Marine Biology from Greenwich University. During his >30 yr tenure as scientist at the Seattle Aquarium, he published many articles in the scientific literature as well as in the trades; international post-doctoral students came to work with him throughout the years. His best loved work discussed the octopus’s capacity for play, as well as the GPO’s ability to recognize specific individuals. – Jennifer A Mather, Roland C Anderson, & James B Wood. 2010. Octopus: The Ocean’s Intelligent Invertebrate.